Namaami Vigneshwara paada pankajam' from childhood. Ganesha Chathurti festival means, at home, in my mother's place, is normal Ganesh pooja with many Ganesh shlokhas. We, Mangaloreans don't keep painted Ganesha or clay Ganesha but pooja is done to the usual Ganesh vigraha! Amma used to make coconut and jaggery stuffed modaks out of maida or wheat flour, fried in oil. The usual different types of fruits are kept in front of god. Appa used to do the pooja reciting a number of shlokas. But after marriage into a Tamil family, the celebration of this festival became entirely different! We have to draw rangoli in front of our doors which was not important in Mangalore/Udupi. We have to draw normal rangoli/kolam on normal days and padikkolam with red coloured border (Kaavi). Normal days' kolam can be drawn with rangoli powder but on festival days it is maakkolam (rice soaked and ground with water, drawn with a small piece of cloth). 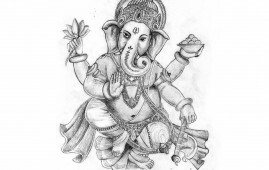 I learnt to draw this kolam very soon. We lived with my sis in law for a few months to learn cooking (very slight difference from Mangalore cooking...use gingilly oil and groundnut/refined oil instead of coconut oil!) and the way to celebrate festivals in Tamil style. I was working then and so learnt some of the tough cooking slowly! One was the making of kozhukkattai/modak on Ganesh Chathurti! I was postponing to learn this and one day my husband said that his cousin had prepared kozhukkattai, the taste of which was still in his mouth! This woke me up from slumber/laziness. I opened the book 'Samaiththuppaar' (cook & see) which was given to me by my friend maami . Did the kozhukkattai and I never stopped from then on! Started doing all the sweet and savouries for all the festivals, thanks to the book! 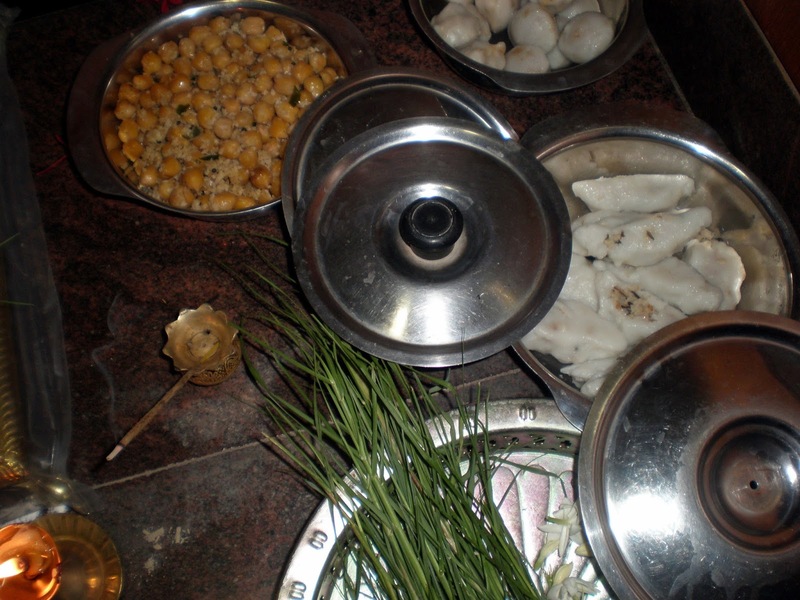 Our Hindu festivals make us become active from our routine cooking. God doesn't expect anything from us except whole-hearted prayers. But in India, different regions celebrate our festivals in different styles. Everything is interesting in their own way! I had written about the way we celebrate Ganesh Chathurti is explained here. So, celebrate festivals happily and enjoy! The recipes might not come out easily in the first attempt, but you will improve in the years to come! P.S. (Edited to add on Vinayaka Chathurti day, 5.9.16): I want to add this song of Seekaazhi Govindarajan, which is my favourite song on Ganesha till date! This is the first Tamil song we learnt after coming to Madras in 1962, without even knowing the language! I, my sister and brother used to sing this together...all of us were very small children then! Enjoy! most street corners..He is popular among young and old alike. K PARTHASARATHY: Thank you, KP! Yes, everybody loves Ganesha! SG: Thank you, SG! Pillaiyaar makes everybody happy! DESTINATION INFINITY: Thank you, Rajesh! Making kozhukkattai is a tedious job...eating is the easiest job! Having lived in Bombay for decades,for us Ganesh Chaturthi has become a special festival. The different ways and types of celebrating festivals, from one part of state to another makes really interesting! Nice to hear about the celebration you had then and latter. Nowadays mom drew maakkolam rarely and I remember it is for Krishna jayanthi while drawing Krishna foot she drew maavu kolam. BK CHOWLA: Nowadays, even southern states are catching up with Ganapathi Bappa Morya! Thanks for the comment, Chowlaji! JEEVAN: I think only Tamilians draw maakkolam. I like to do it and so it is done everyday in front of my door on the granite floor which stays till the next day unlike podi/powder kolam!